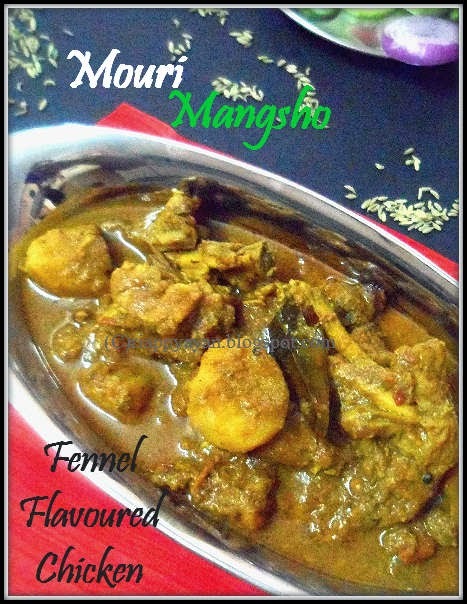 Today I'm here to share a very distinctive traditional bengali recipe of Chicken, fennel flavoured Chicken or Mouri(fennel in bengali) Mangsho. Traditionally, mutton is mainly used for this recipe, but chicken is another variety which I ate in my friend's house. 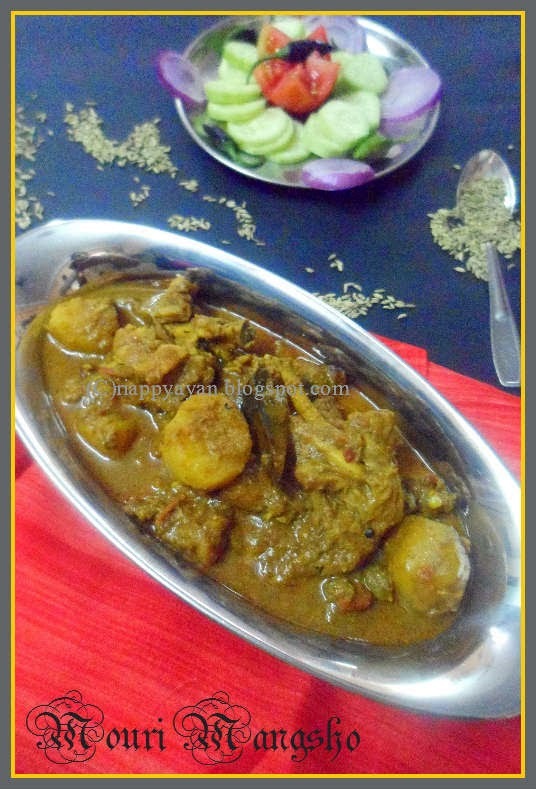 For a long time I looked for the recipe, then finally I found a co-blogger's recipe on web, who is also a good friend of mine, Soma of eCurry. I can totally rely on her recipe with closed eyes and this time also I was right. I totally followed her every step and no doubt the end result was something very distinctive. Fennel seeds are highly aromatic and flavourful. It has many medicinal properties, a good digestive being the very important and first one. In India, at homes and in restaurants, it is used as a after-meal digestive and sometimes, sugar-coated, or un-coated and slightly roasted fennel seeds are some of the varieties used as a mouth freshner. Thick Yoghurt : 3 tblsp. Turmeirc powder : 2 tsp. Mustard oil : 1 tsp. Black Peppercorns : 7-8 nos. Tumeric Powder : 1 tsp. Fennel seeds : 1 tblsp. Cumin seeds/Shah jeera : 1 tsp. Wash chicken and pat dry. Then marinate them with mustard oil, salt, turmeric and red chilli powder for 30-45 minutes. After that add yoghurt and rub well in each chicken pieces. Keep aside for another 1 hour or more if possible. Heat a tawa well, then lower the flame, dry roast shah jeera or cumin seeds and 1 tblsp. fennel seeds on it until you get some roasted smell. Do not let them brown or change color. Cool and grind into a coarse powder. Keep aside. Heat 4 tblsp. oil in a pan, fry the cubed potato pieces, which should be smeared with a pinch of turmeric and salt for 1/2 an hour before frying. Fry till they are lightly brown, then remove and keep aside. In the same oil, add slightly pounded green cardamoms, cloves, cinnamon, black peppercorns and bay leaves. When spices start to splutter, add chopped onions. Fry till they are translucent for about 4-5 minutes, than add 1 tsp. sugar, caramelized sugar gives the curry a nice reddish brown color. Fry for another minute or so or until sugar dissolves. Then remove chicken pieces from marinade and add all the pieces in oil, fry for 4-5 minutes or until their rawness goes away. Then add ginger-garlic and green chilli paste. Saute for 2 minutes, then add turmeric, red chilli powder, coriander powder and the roasted cumin-fennel seed coarse powder. Sayte for another 3-4 minutes. Now add left over marinade and tomatoes. Mix well with everything and in medium flame let the spices cook. Do noy hurry at this stage as this is the crucial step of cooking. In medium flame let it cook. Do not forget to stir and mix everything well together. When you see oil is seperating from the spices, then you know it is done. Chicken will also be half cooked by this time. Add about 1 cup hot water into it. Add salt and fried potato pieces, cover the lid and in medium flame let the chicken cook. When potatoes are just done and chicken pieces are also cooked, and you have your desired amount of gravy, remove from heat. Keep some amount of curry if you want to devour it with hot rice and if you want relish it with roti, naan or puri, then thicker gravy is more desired. 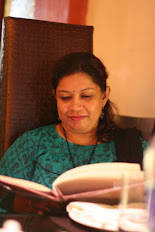 It's upto you, I enjoyed my curry with piping hot rice. I'm linking this recipe to my ongoing event, "Spotlight : Indian Spice Tray- Fennel/Panch Phoron"
I'm asking my co-bloggers to send in their treasure recipe using this exotic spice. Please support this event as you always do. 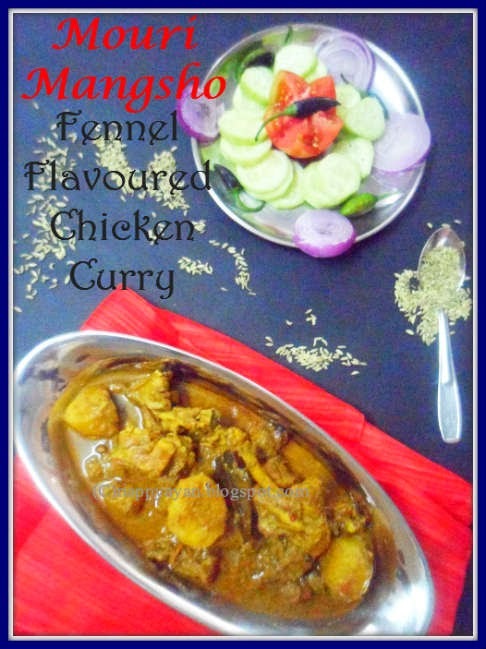 Love fennel flavour in chicken curry, this delicious curry is inviting.